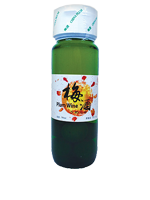 Longevity Plum Wine | Chinese Wines | International Beverage Holdings Ltd. Known as "Umeshu", plum wine is a fruit wine made by steeping the revered "ume" (green plum) in Sochu to produce a sweet and smooth drinking wine. Our Longevity brand is produced for standard at home drinking and is best drunk chilled or over ice. Copyright 2019 International Beverage Holdings Ltd.